The only time I have ever seen a fog bow is very early one summer’s morning, as we were driving towards Loch Awe and Taynuilt in Argyll. The mist was lifting quickly against a brilliant blue sky, and suddenly we saw it hovering there in front us, ghost-like. Less than a minute later, it was gone. Fog bows follow same laws of physics as rainbows, with a few vital differences. They require a combination of mist and bright sunshine, and the sun must be less than 40 degrees above the horizon. Because the water droplets in the mist are so tiny, they are unable to split the rays of sunlight into a distinct spectrum of colour. The coloured bands are diffracted or scattered, creating a wide but hazy bow whose centre is the ‘antisolar point’, i.e. the point opposite the sun in the sky. You can find out more, and see examples of fog bows, at www.atoptics.co.uk. Wow that is amazing! I’ve never been aware of this natural phenomenon before. Thanks for alerting me to fog-bows. Isn’t the world just mind-boggling in its possibilities sometimes? Yes, it is Christine! I had read about them on the Atoptics website (which is great for finding new weather stuff you’ve never heard of!) but I never expected to see one! Really glad you liked it. I haven’t seen that programme, Lynne, must take a look. There are so many different weather phenomena and ‘bows’ or ‘arcs’ that I never knew existed! I have never seen a fog bow before, or at least been aware of it. This is very interesting and I will have to keep my eyes open now to see if I can find one. I know, it’s amazing, isn’t it? I hope you see one. You can also get ‘moon bows’, which I think are explained on the website I gave – it’s a mine of weather-related information! That is amazing, and has helped to clear up one of my mysteries. I saw something very similar to the picture you have posted, and have always descibed it as a rainbow at night, only it was white. There was no moon and the sun was below the horizon. I saw it fleetingly to the side of my car (could it have been created by the light from the headlights?) and so did a passenger (or I would have thought I was imagining things!) 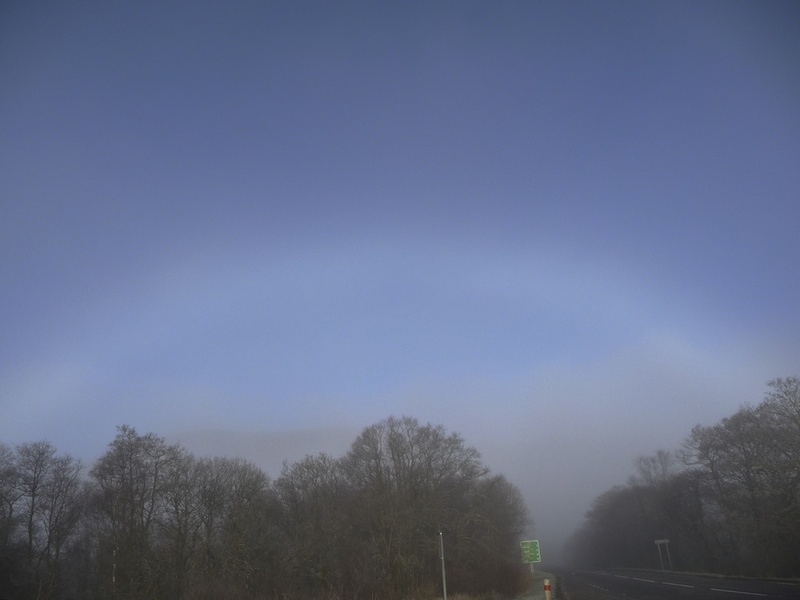 I assume now that it was a fog bow – so many thanks for clearing up that mystery! (although I feel it’s good to have some experiences that are never explained. Thank you for sharing this, it sounds amazing! I can’t be certain that what you saw was a fog bow, as I’ve never heard of them being created by headlights, but it sounds the most logical explanation. Sometimes I prefer not to go with logical explanations, though! 🙂 As you say, some mysteries are best left unexplained! Wow, I learned something new today- thanks, Jo! Excellent! 🙂 Now you’ll be looking for one!